Mandy Macdonald is an Australian writer and musician who has lived in Aberdeen since 1992. 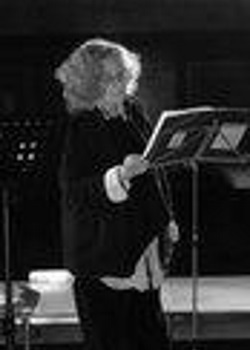 Her lifelong interest in both early music and the avant-garde dates from her time as a student at Sydney University. She has a diploma in music from the Cambridgeshire College of Arts and Technology (now Anglia Ruskin University), which included both acoustic and electronic composition. She performed Karlheinz Stockhausen's Stimmung at Kettle's Yard, Cambridge, in 1978. As a member of Mars in Aquarius in 2015 and early 2016 she performed numerous pieces from Stockhausen's two collections of intuitive music, Aus den sieben Tagen and Für kommende Zeiten, as well as improvisatory and more structured avant-garde works. Intuitive Music Aberdeen thus represents the development of a long-standing fascination for Mandy, and she has contributed to the group's collective compositions such as Cirrus and stars and Economic Suite (first performed at St Andrew's Cathedral, Aberdeen, on 7 October 2017). Mandy is a long-standing member of Con Anima Chamber Choir (Aberdeen), Aberdeen Bach Choir, and Highbury Chamber Choir (London), and from 1999 to 2008 was a member of the Edinburgh Festival Chorus. 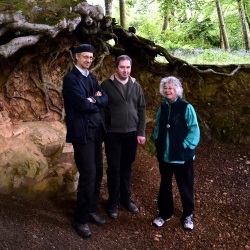 In 2016, at the Edinburgh Fringe and in Aberdeen, she performed with the Australian group Waldorf Wayfarers both a short composition of her own (Ave Maria, 1960) and a largely improvisatory piece, based on sounds of the rainforest, by Australian composer Stephen Leek. Mandy's poetry also appears in a variety of printed and online publications. She is particularly interested in interdisciplinary performance that interweaves music and other arts such as poetry or the visual arts, for instance in Emerald Earrings and Grimes Graves, two poems with music by Intuitive Music Aberdeen. In Intuitive Music Aberdeen, Mandy sings and plays electronic keyboard, harpsichord, recorder, and small percussion.